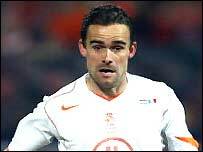 Dutch international Marc Overmars has announced his retirement from football. The former Arsenal winger, who has played at Barcelona since 2000, revealed that a persistent knee injury had forced him to call it a day. "My knee has caused me lots of problems and I can no longer continue to play at the level that I want," he said. Barcelona president Joan Laporta said: "We are enormously grateful for his sincerity and for the dignified act of the player." Overmars, 31, leaves Barcelona without recompense, despite having a year remaining on his contract. He played as a substitute in several games for Holland at Euro 2004 last month and started in their semi-final loss to hosts Portugal. Known for his dazzling turn of pace, he was part of the 1995 Ajax team that won the Champions League before moving to the Premiership, where he helped Arsenal to a League and FA Cup double in 1998. He became the most expensive Dutch player of all time - and the most expensive player in Barcelona history - when he signed for the Catalan side for a fee of around £25m two years later. But he failed to produce the sort of eye-catching form he regularly displayed at Arsenal and Barcelona told him at the end of last season that he could leave the club. The midfielder has been a regular fixture for Holland over the past decade, appearing 86 times and scoring 17 goals.